F.B. 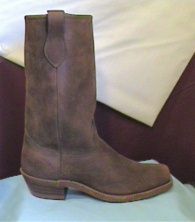 FINE BOOTS #AB511-20 Tan (tobacco) Plain square toe. The Classic simple square toe mens boot. Plain, simple always dependable. Non-skid or leather sole. Tobacco color shown. Black, also available.